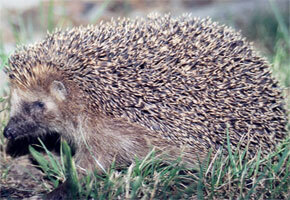 Often heard snuffling around the garden on a summer evening, searching out all those juicy slugs. Hedgehogs are an important part of our garden pest control and now that autumn is fast approaching, we have to think about where these useful creatures are going to live. They need somewhere warm and dry to hibernate, usually under a shed, pile of leaves or old logs. The latter can be precarious, as we may inadvertently disturb them or even harm them when we build bonfires and use strimmers. We can however, create purpose built houses for them to ensure they stay safe from predators and accidents.